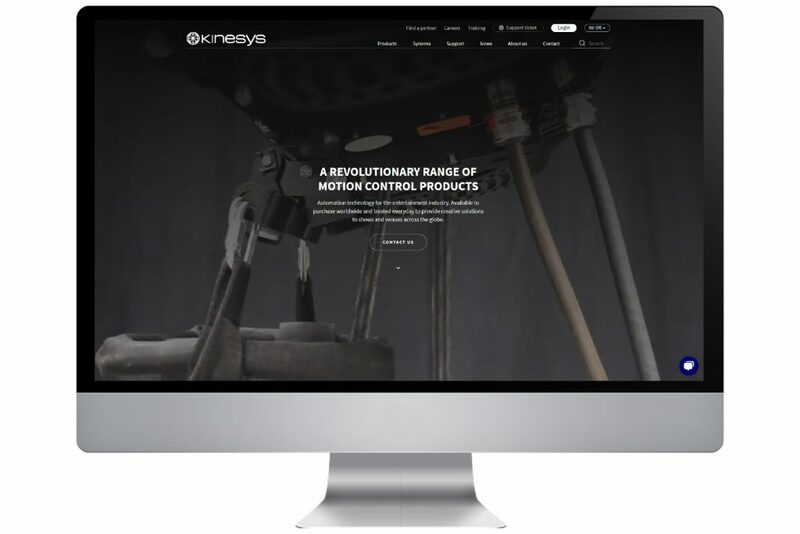 Leading automation manufacturer Kinesys launches a new website at www.kinesys.co.uk and www.kinesysusa.com. This stylish, highly visual and contemporary environment reflects the brand’s identity and reputation for excellence, innovation and imagination. It will be a key communications hub for Kinesys clients, end-users, technicians and anyone wanting to discover more about the company and its products and services. Several important new features include Live Chat, Support Tickets, Social Wall and Newsletter sign ups, together with thought-provoking articles, opinions, news and other sources of valuable information and technical detail. This brand new platform was created due to the growing interest and trend for automation as a visual component of shows, events, installations, venues and many other applications. Kinesys MD Dave Weatherhead stated, “Many of our customers are embracing automation for the first time, an area where there is a massive amount of information to take in plus many safety elements and standards of which to be aware. There are also plenty of rumours, hearsay and ‘perceived wisdom’ out there which is often wide of the mark! “To address this, we wanted to find a way of demystifying automation and motion control and provide a forum where end users and customers can find facts and quality information to help them understand the reality – and the potential – of using automation”. The website hosts all this content in an authoritative, easily navigable and highly accessible portal. Additionally, it gives users and customers – via the vibrant Social Wall – a channel for highlighting to the world, all the creative and interesting ways in which Kinesys equipment is being used on shows and events, in venues and installations. Live Chat: Customer service and technical support has underpinned Kinesys philosophy from the start. Live Chat integrates the sales and product teams with the website to offer fast and convenient information and answers. Support Tickets: For technical queries, support tickets can be submitted direct from the website. This offers the fastest way to get in touch with the right person. Content: A lively and animated mix of blogs and vlogs plus a proactive news feed will help educate and inform about Kinesys products and systems. It is also the first port of call for access to numerous support resources. Newsletter: Visitors can sign up to receive the latest Kinesys e-newsletters detailing products, support and applications. Customers can also get unique logins which enable access to further resources. Social Wall: Integrated with all Kinesys social media channels, the Social Wall collates and details the most up-to-the-minute activities on Twitter (Kinesys has just hit 1000 followers), Facebook, Instagram and LinkedIn. Anyone can feature on the Social Wall by using the #KinesysInUse hashtag in their Tweets. Refined Usability: The site is easy to navigate and search for any product, news story or resource, and each of these areas also has related content on the individual pages for straightforward cross-referencing. The Team: Fully aware of the significance of people in this industry, get to know the dedicated and talented Kinesys Team on the About Us page – a friendly and informal approach complete with employee bios and pictures that enable people to become a bit more familiar with the people they are communicating with day-to-day.